Click the card deck image below to shuffle the cards. From a neutral state of mind, ask the question you want the Oracle to reveal. 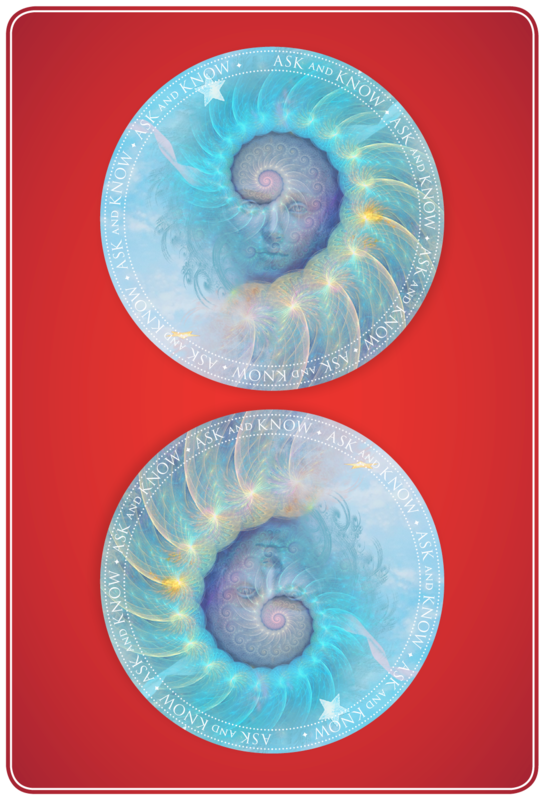 Double-click on the cards that speak to you most to find which Oracles are guiding you now and read the messages. Essential meanings: Abiding by social rules; conformity; respecting cultural or family customs; universal laws. The Oracle's Message: The universe works within a structure of Divine laws and principles that provide a framework for human experience and evolution. The Law of Abundance, the Law of Prayer, the Law of Karma, the Law of Attraction, the Law of Thought, the Law of Compensation, and the Law of Nature are only a few that are known to us. These principles create perfect order and operate with a kind of precision beyond human understanding. Even revolution has its place in universal law. Human beings, in turn, have their own laws and customs that vary from culture to culture and family to family. Our laws keep social order and govern human behavior, reflecting our instinctive understanding that harmony is important. This is a time to learn these laws and conform to them, rather than being the rebel and flouting the rules. When this card appears, submit to structure and follow the rules even if they seem to make no sense. Release resistance, for universal laws will correct any disharmony. Open your eyes to those universal laws and it will be easier go by the book at this time. Relationship message: Getting along with others includes understanding and respecting who they have become as a result of their environment, culture, and experience. Find the middle ground that allows the relationship to flourish while honoring the individuality of the other person. Go by the book instead of trying to break the rules or pressure others to conform to the way you want to do things. Your connection will deepen as a result. Prosperity message: At this time, you can expect a return on your investment. Whatever you have pursued—be it a dream you’ve long cherished, a skill you’ve cultivated, or a service you’re called to—will come to you if you are willing to go by the book. You don’t need to reinvent the wheel to be successful. Follow in the footsteps of others who have already achieved the things you’re striving for. You can learn a lot by observing the structures that are already working. Your creative projects and commitment to prosperity are in alignment with the needs of the world, but impatience may tempt you to cut corners to get there more quickly. Stick with what you know works, and you will achieve and attract abundance. Essential meanings: Endurance; strength; the long haul. Protection message: Do you feel as if you’ve been wandering in the desert now for ages and ages and nothing is happening? When you conjure up the image of a desert, you see parched lips, sunburned skin, and mirages—but there is more to it than that. Amid the hot sands are creatures with resilient spirits, tough skin, and the willingness to burrow deep underground for water so that they may thrive. This is a time of developing survival skills and resilience. You are learning how to conserve your strength, and in this temporary time of austerity, it’s wise to be selective about where you expend your energy. Listen to the call of your soul because it will never lead you astray. This is an important time for letting go of what’s not important. Protection message: Sometimes subconsciously denying the truth may drive you toward a specific outcome aligning with an intention that is hidden from your awareness. For example, you may want to be prominent in your profession, but your desire is not really about sharing your talents but about making yourself feel better, because fame would cause people to admire and approve of you. Or you may want to reunite with the partner who rejected you because you believe that your love continues to be strong, but deep down you what you really desire is to be with that person so that you can have the last word. Now is the time for deep soul-searching of the “why” that drives your choices. What you uncover will set you free and bring you ever closer to the happiness you seek. Essential meanings: Time to make a decision; considering the consequences as you prepare to act; owning up to your ability to make a necessary choice. Protection message: Indecision is extremely frustrating and will lead to anxiety, loss, and confusion. At this juncture, you can’t remain in place without losing your way altogether. Avoid the tendency to let others choose for you, which is a way to subtly refuse to take responsibility for your choices. Don’t give your power away, not even to this oracle. By not making a choice, you are making a choice, for which you must be accountable. If that choice leads to undesirable circumstances, take heart: Spirit never tires of giving you second chances. You can always start again once you’ve learned this valuable lesson. Essential meanings: A need to see beyond the superficial; the desire to don a mask or dress something up to disguise its true nature; trying to be something you’re not; chasing after every sparkling new thing; being mercurial. The Oracle's Message: It’s only human to want to adorn ourselves in trinkets and paint a pretty picture of ourselves. It’s natural to want to acquire the trappings of status—or to deny them as a statement of rebellion. But if it sparkles, is it better? Whether it’s a fast car, a big house, a title or position, the power of authority, or the sparkling of diamonds, these icons let us know something about a person, place, or thing. Or do they? The truth is that we seek to acquire things because of what they will do for us, and how they symbolically will elevate us and make us more attractive. This card signals that it’s time to see beyond the adornments and probe underneath the glitter. Learn to recognize the masks people wear and the motives underlying them. Imagine that all the glitter is gone. Would you still desire the object or person? Relationship message: Sometimes we try to become something we’re not to impress others. We embellish a story a bit, adding some dramatic elements to make us more appealing. The real person becomes hidden behind the sparkle and shine. Then there are times when we don’t see the true value of someone else because he or she may not have the glitz and glamour that seem so desirable. Now is the time to look past the surface, beyond the mask, to the essence of a person. Who that person is, not what he or she has or can give you, is important now. See beyond the glitter and look for the inner glow. Use the eyes in your heart. Let go of artifice and let what is authentic shine. 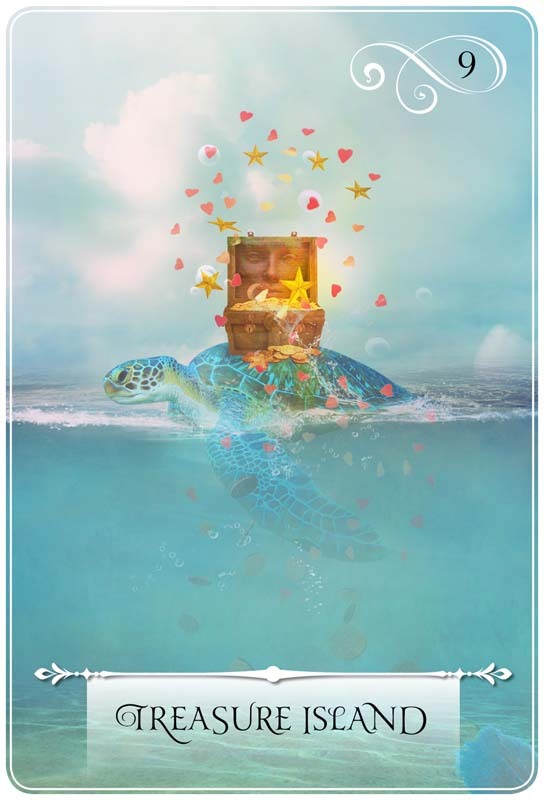 Prosperity message: Sometimes an opportunity looks so good that it glitters like gold and you just can’t resist it, especially when it appears others are doing so well and have hit the mother lode! Just as during the American Gold Rush everyone hurried west to find their fortune and then deserted entire towns after the mining depleted the gold veins in the earth, so too can you to deplete yourself as you chase after the latest shiny thing that has caught your eye. There is a mercurial quality to your present circumstances. Pay no attention to those who chase after fool’s gold. Resist the temptation to be jealous of others. What they have achieved may not be the true success you seek, so don’t compare yourself to them. You see only the surface right now, only the sparkle. Be assured that you will experience your own shining moment if you stick to what you know. All that glitters may not be gold for you. Essential meanings: Harmonious partnerships; love; friendship; companionship; a relationship fostering personal growth. Protection message: An important relationship brings you to your knees. This is the kind of soul mate that comes with a powerful gift. Your patterns and all your old stories that don’t serve your well-being enter into this dynamic so you can heal them. This person is called to a sacred task—to help you learn, even if it seems uncomfortable, sticky, and inconceivable. The question is not Why did he do this to me? but rather What is the gift in this? Look into this mirror. You will only be changed for the better. Essential meanings: Being grounded in everyday experience; humility. 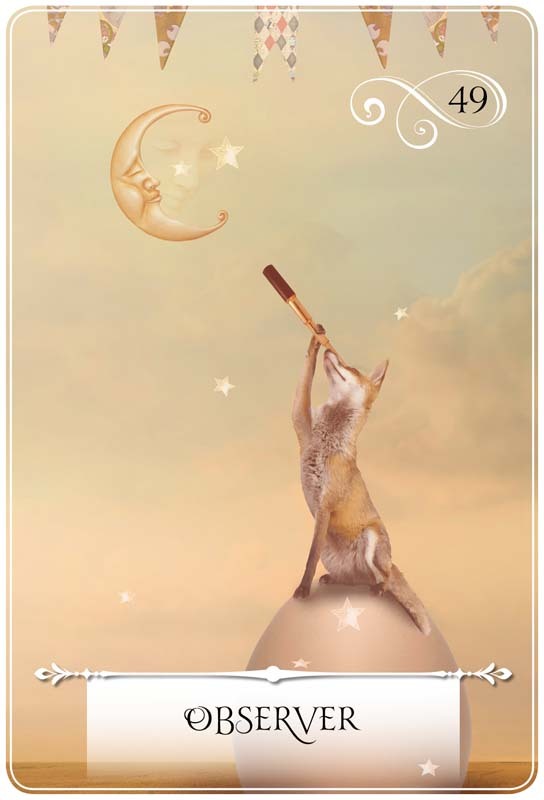 The Oracle's Message: There are times when the big dream is meant to be laid to rest in your consciousness so that you can pay attention to the simple chores in your life. Consider why pruning a tree is as important as delighting in the beautiful blooms when they are in full blossom. The mundane act of pulling off dead leaves, watering the soil, and then leaving it alone to let nature take its course is an important step in manifestation. Taking your attention away from your goal brings you into a state of receptivity. This is the deeper and profound purpose for releasing attachment. When you engage the everyday tasks in a meditative, contemplative way, you clear your energy to receive your Aha moments, which brings you ever closer to what you seek. Relationship message: Nothing is as important right now as just doing what you need to do day to day. Let your heart remember that not everything has to be hard, passionate, or even obviously meaningful. Relationships and friendships go through lulls when the everyday tasks are at the center of awareness. That is perfect right now. Hold hands, wash dishes, make a fire, read a book, share a meal, say nothing, stare into space, pick up socks, tell a dumb joke, and leave space to breathe. The “work” of your relationship right now is very simple: just to be present and sharing. Funny how it takes work to “just be.” All is well, really. Prosperity message: Now is the time to take small steps rather than the larger leaps on the journey to creating your most prosperous life. Move your focus off your big dream and attend to the mundane chores. Focus on the little things that may have piled up while you’ve been planning your big life, the greater plan that you aspire to see manifest into reality. “Chop wood, carry water,” as the Zen proverb advises—or wash dishes, walk the dog. . . . While you’re doing all that, Spirit will have a chance to move mountains and set wondrous miracles in motion for you. Remain humble and aware of the present. Essential meanings: The Law of Giving and Receiving; currency; trade-offs; weighing costs and determining value. The Oracle's Message: You’re entering into a productive and enriching time when all manner of opportunities are being offered to you. You have everything you need to seize them. Yet in order to honor them, you must put in the time, exchange your experience and skills, and commit heart and soul to what you’re choosing to pursue. You can do it! You have what it takes to be successful if you align with the Law of Giving and Receiving. You must engage in a dance of give and take, push and pull, doing and being. If you let fear guide your choices, you could deplete yourself or create an imbalance. This is not a time of just do, do, do. Use your currency wisely and be mindful of the value others bring to your life. Relationship message: Love is an exchange of life-force energy between two living beings. It grows exponentially when it’s reciprocated. You must give and receive in order for love to flourish and abundance to flow between you, nourishing you. Spirit wants you to start accepting all the blessings waiting for you, as well as offer the same gift in return. Open your heart and allow it to be filled! Let love in and let it flow out of you, too. Love is truly yours today. Prosperity message: All your hard work and efforts—your commitment to learning, creating, and spending your time wisely—pay off in ways you may not have been anticipating. The gifts of yourself—your time, your ideas, and the energy of your intentions—are being reciprocated by the universe, which is sending you signs and signals, aligning synchronistic meetings and opportunities to bring you success and more. Everything is an exchange. Keep doing what you’re doing. Goodwill comes back tenfold. Essential meanings: Transitions; not being quite out of one situation and fully engaged in another; temporary blindness; no-man’s-land. Essential meanings: Being ready; bringing something to light; being at your best; confidence. The Oracle's Message: You can be assured that you are ready for anything right now. You know what you need to, your skills are sharp, you’ve come to this place with wisdom and knowledge, and you sense a new phase of your life about to begin. People respond to your confidence and trust you. This is an auspicious time to begin new things. Relationship message: When you’re confident and happy in your skin, you are ready for deeper, more intimate relationships. You have nothing to prove right now. You are completely yourself and can handle anything now. Love, friendships and harmonious new connections are all present now or coming in. You’re ready to give and receive from the heart. This is a beautiful place to be. 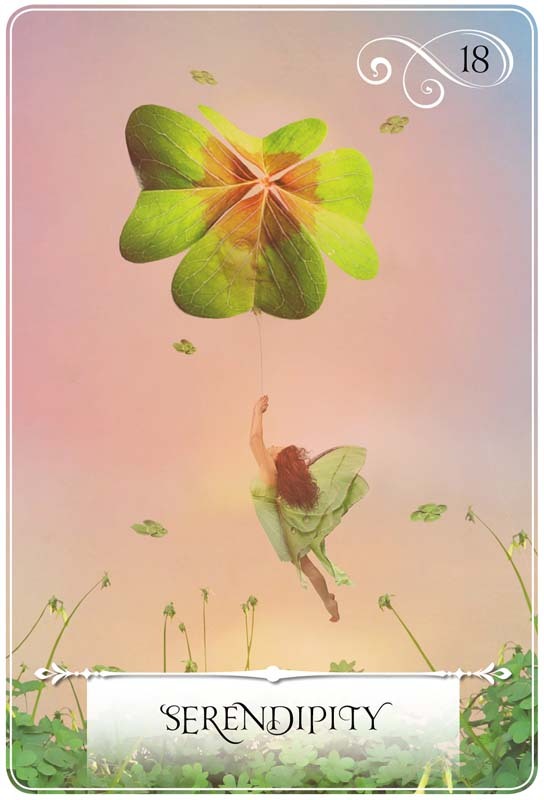 Prosperity message: You have every reason to feel confident. Everything you need to make your success concrete is now at your disposal. You can take action knowing you are ready to step into your power, into your light and into your service to the world! The direction you’re moving in is your Destiny. Your soul is smiling with joy as you align with this truth. Essential meanings: Opportunity allied with readiness; the awareness of synchronicity; luck and good fortune appearing as signs and symbols; a magical alignment of events. Protection message: Perhaps you felt almost certain that serendipitous events were meant to lead to something better. It was supposed to be the perfect business, or that person you gave your heart to was supposed to be “the one”—yet it all fell apart! Consider this: Sometimes synchronicity and serendipity come together to lead you directly into difficulties in order to deliver an important lesson you need to learn before you hit the jackpot. Don’t get caught up in the drama of disappointment. There really is a silver lining in this cloud. Spirit always knows what you need and is guiding you to where you are meant to go. Pay attention to the signs presented to you. Essential meanings: Freedom from attachment; radical acceptance. Protection message: Now is a time for calmness and well-being in spite of temporary conditions. Even if there are dissonant notes in the music of your life, all that means is that you must go within and fine-tune the extraordinary instrument that you are. This is a time to find harmony within yourself and not look to the outer world to provide certainty. This, too, shall pass, and once again your life will sing with beautiful music. Essential meanings: Unfinished business; an incomplete lesson; lack of closure; the need to make amends. Protection message: When unfinished business casts a shadow, it is a reminder that procrastination is a form of self-sabotage. It is not in your best interest to stall. Even stumbling forward is better than holding back. Don’t overthink things or let yourself get distracted—just tie up any loose ends up and deliver the results. Don’t quit before the finish line. Spirit wants you to win. Essential meanings: The Law of Attraction bringing dreams into fruition; the results of positive thinking made manifest; abundance appearing as if from nowhere; financial gains and the sharing of good fortune. Protection message: Poverty consciousness and a sense of “not enough” cast a shadow on your path. These ideas and core beliefs come with a high cost. Do you really want to proclaim yourself a victim of disappointment and failed expectations? Are you avoiding success because you will grow so tall that others will want to cut you down? Or is it possible that you’re caught in a fear that you will lose what you have acquired, so you hold on so tight and you miss the opportunities to expand? You are challenged to change the way you see the world and move from a perception of limitations to a perception of abundance. Take a risk, for you have nothing to lose except sitting in a prison of your own making. Open the door and find the abundance waiting for you to claim it. Essential meanings: Timelessness; Divine timing; immeasurable time. The Oracle's Message: When humans created time, everything changed and contracted. We have come to look at life in a linear way, imagining that the past is behind us and the future ahead of us. But what if that isn’t true at all? What if everything were happening now, in a glorious timelessness of creativity and beauty, chaos and order? You have all the time in the world to co-create the life you desire, so release your agenda. Let go of your need to form and shape each moment to your expectations, knowing that what is yours will never be withheld from you. Miracles are here right now, and always show up when you need them, right on time. Relationship message: Love, the fulfillment of desire, and even the body’s reproductive cycles have their own timetable. Some things are preordained and cannot be coerced. Everything has its season, its Divine and appropriate timing, especially when it comes to matters of the heart. Remember that you always have enough time for love—to find it, to nurture it, to give and receive it. The clock is eternal and ticks according to your heart’s schedule, in perfect rhythm. Isn’t that wonderful to know? Love is always right on time. Prosperity message: Your prosperity is co-created by your efforts as they occur in human-made time and the efforts of your most important manifestation partner—Spirit—in a Divine, measureless timetable. So keep doing what you’re doing. Stay positive, and make a commitment to remain in high-vibration thoughts and feelings. 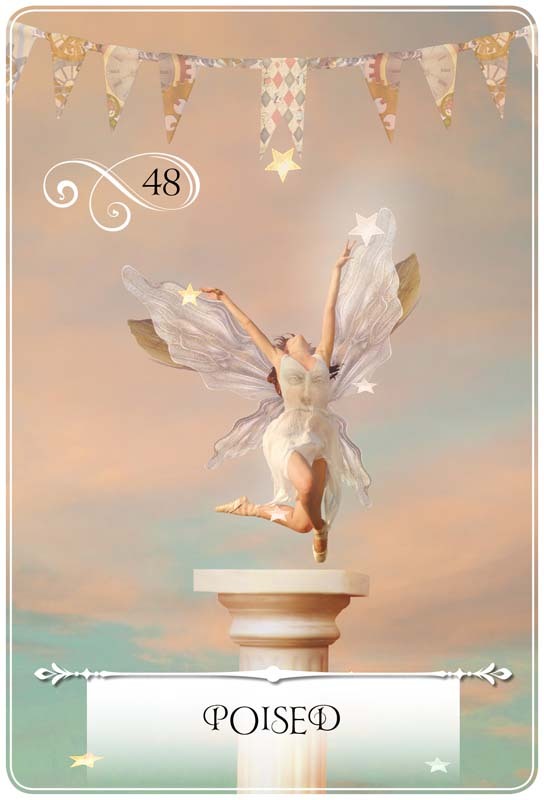 If you heed the message of this card, it will seem as if in no time at all, you will align with your highest calling and your highest good, making your dreams come true and come together like magic. So what’s all the fuss about not having enough time? The prosperous life that is yours will never pass you by! Essential meanings: Balance; justice; a need to consider options; mutual benefit; the Law of Cause and Effect. Protection message: Injustice and inequity are part of life, but they do not have to define your experience. This is a time when you may observe an injustice righted and fairly settled. Perhaps you come to the rescue of someone else, or be called to answer for a personal slight. You will be amazed by the sense of power that surges through you when you stand up for yourself and others. This card also indicates a good time to advocate for others who are less fortunate. Choose your cause and commit to it, because you can make a difference. One thing is for certain: if fairness is your intention, the situation will be resolved for the highest good of all concerned through acts of kindness, empathy, and courage. Essential meanings: The spiral quality of events when a lesson isn’t quite integrated; cycles you are challenged to break, revisiting a pattern from a new perspective. 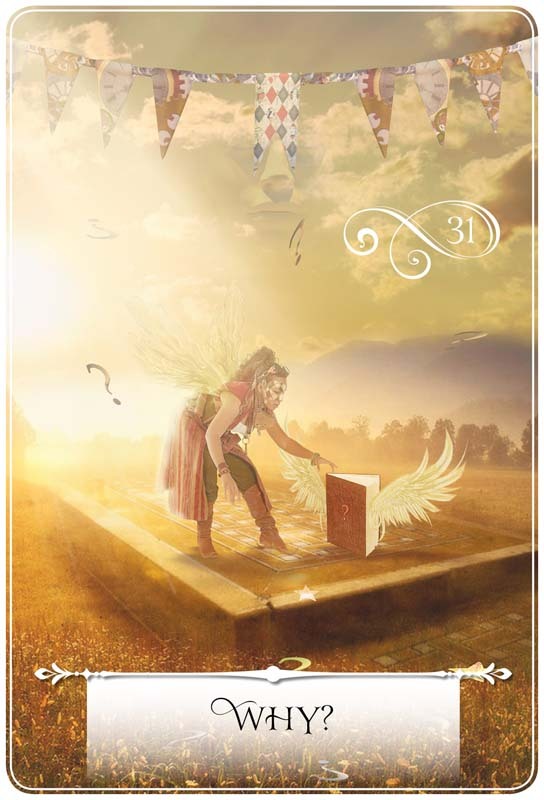 The Oracle's Message: The appearance of this card is a reminder that although it may appear that you’ve gone backward, the truth is that you are standing at a higher level, looking down into your circumstances. You will learn something, do something better, and break a cycle set up in the past. You actually have a bird’s-eye view over your initial footprints and can access the wisdom and lessons learned. Relationship message: Are you wondering, How did I get here again? Does something feel familiar right now in your dynamics with others? Maybe a little too familiar? Don’t be surprised that you’ve found yourself repeating an old story with the same sort of person, who may not look similar but who attracted you because of your easy acquaintance with his or her qualities. Your relationship is a mix of what is good and what is potentially challenging. You have been drawn to this person through the perfection of Spirit’s plan for your evolution. You may have circled back to an accustomed spot, a familiar place, but that’s fine as you get to do things again, only differently this time, for you learned something of great value since the last time around. How will you choose to behave now that you’re aware? Remain curious and stay out of the blame game. Prosperity message: If you’re in a circumstance that appears to be an echo of something that’s already happened in the past in your work life, it is because you’re being invited to see what you couldn’t see before. This is a perfect time for you to look at the deeper motives and attraction you have to the opportunities and people who have entered your life to be part of your journey to prosperity. Who helps you navigate? Who sabotages you? Who supports you? What are the familiar signs, and your responses to them, when you find yourself in a repeat of a pattern of the past? It’s a good time to get a coach or mentor who can help you see what you can’t on your own. Repeat what works, not what doesn’t. Then you will free yourself from the old cycles and cease going round and round. Essential meanings: Patience; waiting; going slowly; all is well; meditation; trust. Protection message: Inertia, laziness, and apathy are signs not of slowing down but of decay and lifelessness. Wake up and do something to shake this off! Go outside for some air. A walk in nature will remind you that all of life is ensouled and magical. Get some exercise, move out of your head and into your body, and breathe in deeply. Each breath is precious. Essential meanings: Perspective; objectivity; neutral observation from a distance. The Oracle's Message: Most of us see the world through a personal lens. We closely identify with our feelings and experiences—so much so that we come to believe that these are the only reality. There are times when we need distance in order to gain perspective and understand our circumstances from a more neutral vantage point. Now is one of those times in your life. This is a perfect moment for you to begin to do some exploring. Instead of only considering yourself, consider what you need to understand about the conditions, people, culture, and environment you’re engaged with now. You’ll be so happy you did. Illumination is the miracle you seek and will indeed find. Relationship message: Sometimes you just can’t see the forest for the trees in your way. Feelings can get all jumbled up, and often you hear one thing when a person says another. It can be like hearing an echo of an unresolved past experience overdubbed onto your conversation. Take time out before you react. It’s likely the other person has no idea how their words have affected you. Rather than just reacting, take a few steps back and lend understanding to the situation. Have faith in your connection and trust that you can come together. Take to higher ground now and become curious about what you observe in yourself, in others, and in the landscape. You will see things much improved sooner than you know. 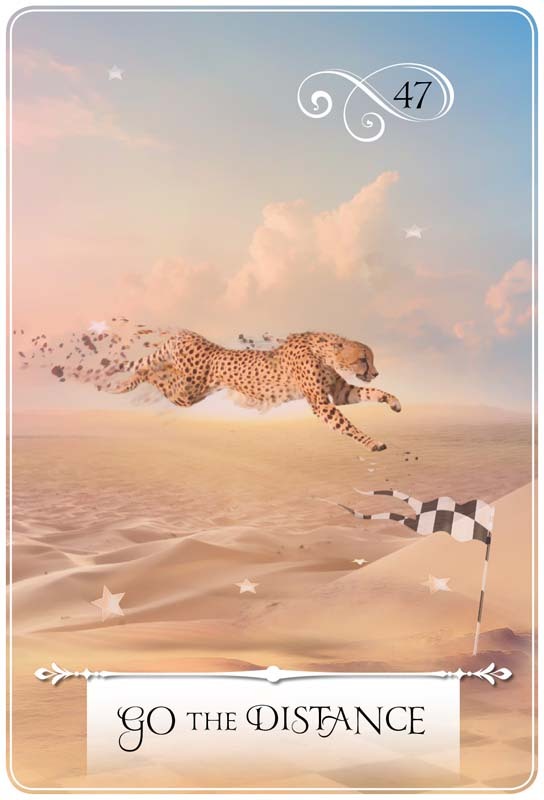 Prosperity message: It is an advantageous time for you to get some distance from what you’re doing and see your work and your projects from a different perspective. The trick is to connect to the essence of your goals and aspirations and let the form and timing be dictated by Spirit. You may be too personally attached to an outcome and can’t see the miracle because it’s not turning out exactly as you planned. Trust Spirit. The perfect version of your abundance is right in front of you. Remain neutral and curious, and watch the miracle unfold.